Winning real prizes for virtual miles is a nice carrot to chase on Zwift, and our monthly missions provide that extra dose of motivation to keep going. A quick look back: we’ve challenged you to complete five workouts; burn 10,000 calories before the end of the year; and ride the Three Sisters route in one go. Our cycling partners come through and put serious bikes and gear on the line. Past prizes include: a Cervélo’s S3 Disc bicycle, Rapha kits, and even a ticket to the Prudential RideLondon. Up for some fun? Missions appear in the top left of the Start screen. Follow the simple directions to begin the mission. An important note: if a mission requires you to complete an objective in one session, you must complete it in one session for it to count. Some missions require multiple Zwift sessions to finish. A new mission drops every month. You’ll receive an email from us with the news. 1. If the mission has a requirement to ride a specific route, like the "Pretzel" on Watopia, you'll automatically be routed to take the necessary turns. Do not try to change your route. 2. If the mission is events related – for example, complete a group workout – you must join the appropriate event to complete. If the mission is not tied to an event, joining a new group ride, race, or other mass-start event during your mission will cancel your efforts. In other words, mission not accomplished. 3. Your efforts are not entered if you get disconnected from the Internet during your mission and don't reconnect; you need to be online for your results to be submitted. How to tell if you’re disconnected? 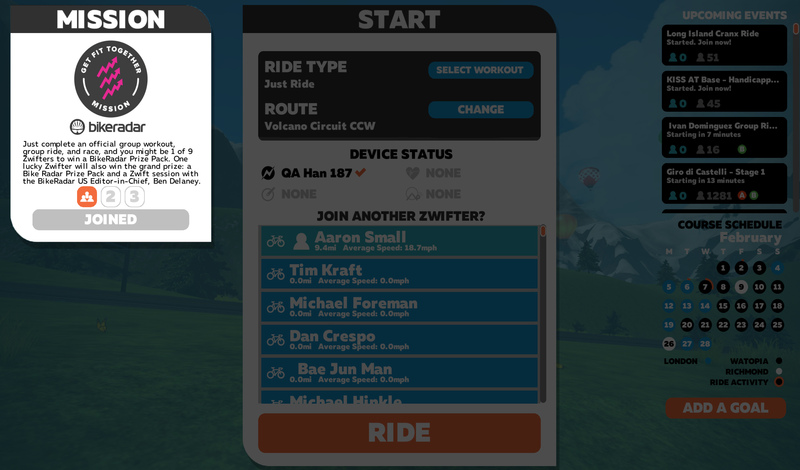 All other Zwifters in game disappear both from your screen and the rider list. See more troubleshooting tips here and here. Keep an eye out next time you log on to Zwift as new missions are offered regularly!